things required to have intimacy with others. At Veritas Counseling, we want people to experience vulnerability in a safe environment. By being a safe place where your story can be told without judgement, we help you develop the strength to face the things that rob you of internal peace. 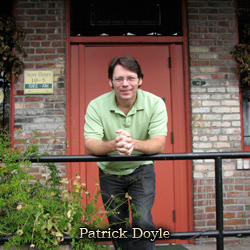 Patrick has a very relatable counseling style that draws upon his personal experience as much as his professional training. He has over 25 years’s experience in therapeutic counseling. He’s been the assistant director for Genesis, Asante Health System’s drug and alcohol treatment center. He has been on the board of directors for Southern Oregon Drug Awareness, and assisted in several domestic violence task forces and treatment programs in Jackson and Josephine counties. He is a pastor, a television and radio talk show host, and a guest speaker for countless seminars and retreats. Pat is married with two young adult sons. His popular television & radio show covers a range of controversial topics. Tune in at 8:00 am Tuesdays on the Dove TV, 91.7 FM or 88.1 FM, or watch online at www.thedove.us.